Enter the "FotoMagico Slideshow Showcase"
A well-crafted digital slideshow is a thing of beauty. Boinx Software and The Digital Story are teaming up to help you master the art of authoring the perfect slideshow, then providing you with the opportunity to share your work with the world. The month of May is digital slideshow month on The Digital Story, and we have lots planned for you. These activities are gathered around the FotoMagico Slideshow Showcase. The Showcase, sponsored by Boinx Software, is designed to help you perfect your slideshow authoring skills. Here's how it all unfolds. In this week's podcast, Sensational Slideshows, I discuss how to pick an appropriate subject and offer some ideas for getting your tools together. Then, as we work through the month of May, I'll be providing tips for building your show, adding audio, making titles, and fine-tuning your presentation. The goal is that after a few weeks, you'll have your slideshow project in production and will be able to submit an entry form to the FotoMagico Slideshow Showcase. In June, we'll select 10 entries to feature on The Digital Story and send out a press release with the names, bios, web site links, and pointers to all of the showcased presentations. This is an excellent opportunity to shine a light on your photography. You need to complete an Official Entry Form for each slideshow submitted, but you can submit as many shows as you wish. The FotoMagico Slideshow Showcase also serves as our Photo Assignment for the month of May. You can send in your entry form before your slideshow is completed (to let us know that you're working on your presentation). In fact it's recommended. Entry forms and actual slideshows are due on June 15. You can complete and submit your entry form here. I encourage Mac OS X users to take a look at the FotoMagico software. It is an amazing authoring tool for slideshows. You might want to watch an informative QuickTime slideshow that demos FotoMagico. Regardless of which tools you use, I hope you will participate in the Showcase. The skills you can develop this month by working with us will benefit you for years to come. Lots of great stuff goes on behind glass. I've talked about shooting scenics through hotel windows, but museums and aquariums are also great windows of opportunity. 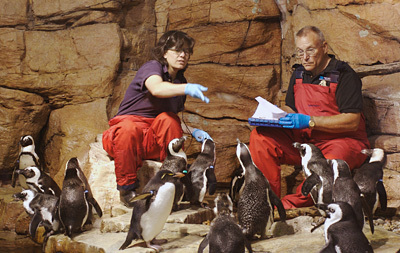 However, lighting in these facilities can make the challenge a bit more daunting. Increase your ISO to 400 or 800. Set your lens to wide angle or mount your favorite wide angle lens. Use a lens hood if you have one. Put the lens hood directly on the glass to eliminate reflections. You can cup your hand around the lens barrel if you don't have a lens hood. Hold the camera steady and take the shot. The specs for this penguin shot are: Canon Rebel XT (350) in RAW mode, 17-40mm lens, f-4 @ 1/30th of a second, ISO 400 with white balance set to auto. If you have the urge to go shoot something interesting, but can't think of a good subject, consider a trip to your local museum or aquarium. You're bound to find something interesting happening behind glass. Casio has refueled the megapixel wars with the first 10.1 megapixel compact camera, the EX-Z1000. In addition to lots of resolution, the new compact features a large 2.8" LCD monitor, anti-shake technology, super-life battery, and a release time lag of only 0.002 seconds -- allowing the shot to be captured practically instantaneously with the push of the shutter button. The EX-Z100 will be available in June for less than $400 USD. 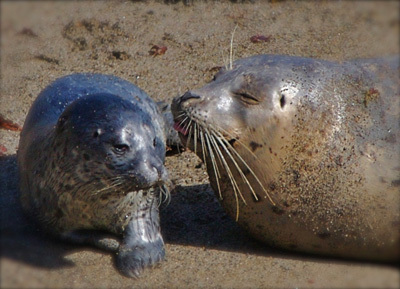 The Harbor Seals in Monterey County pup during April. During my recent explorations, I found a sheltered cove where the pups were learning to swim and hunt with their mothers. There were over a dozen pairs that were taking turns venturing into the water, then returning to the beach to nurse and rest. This pup must have done well after his recent excursion, because if you look closely, he's about to receive a kiss. This shot was captured from a cliff above the beach where I could observe but not disturb the seals. I used a Canon 75-300 Image Stabilizer on a Digital Rebel XT in RAW mode. The ISO was 400 with a shutter speed of 1/750 @ f-9.5 with image stabilizer turned on. I handheld the shot at 300mm. Back in January I posted a short article about Lightzone. I was introduced to this image editor/photo manager at Macworld, and it seemed to be attracting a lot of attention. At the time, the price was $249. Lots of news on this front since then. LightZone now runs on both Windows and Mac OS X. The new Universal Binary version is compatible with both PowerPC- and Intel-based Mac computers. 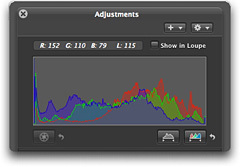 Version 1.3 is available to all current owners of LightZone as a free software update. The company claims it provides increased performance and camera compatibility. Plus, they've also reduced the price to $149.95. Seems like high-end photo managers are coming back to earth. With Apple's recent announcement of Aperture 1.1 with better performance and a new price tag of $299 (down from $499), and now Lightzone's reduction to $149.95, I'm curious to see what price Adobe is going to announce for its new product, Lightroom, later this year. Digital cameras are really computers with a lens attached. And just like our desktop computers, their operating systems need an occasional upgrade. These are called firmware updates, and they're designed to fix known problems and sometimes add new functionality. The procedure usually goes something like this: You download the firware update from the camera manufacturer's website, copy it on to a memory card, put the card in your camera, initiate the firmware update, don't touch anything during the updating process, then clean off your memory card and go take pictures. 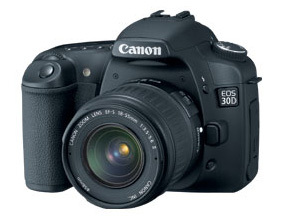 DP Review has published an exhaustive look at the new Canon 30D. 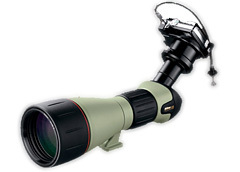 Among their "pros," they cite excellent resolution with very good per-pixel sharpness, welcomed spot meter, low noise at high ISOs, great long exposure capability, spacious 2.5" LCD monitor, and excellent construction. For the "cons," the auto white balance has only average performance, and the ISO sensitivity is not displayed on the top panel. Even though some people have complained that there wasn't a megapixel upgrade with this model, DP Review said there is really little "real world" difference between 8 and 10 megapixels. 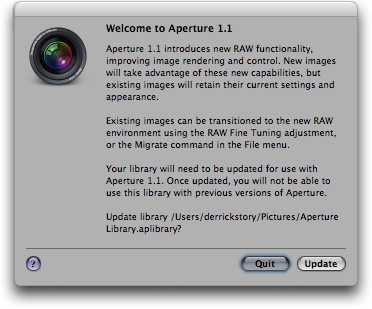 If you have Aperture already, version 1.1 is available right now via Software Update. If you haven't purchased it yet, Apple has lowered the price to $299 (down from the original $499). 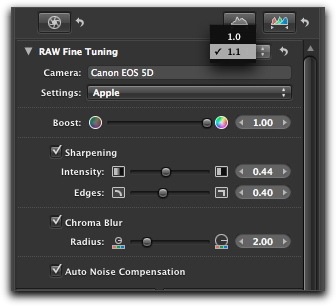 I've been using Aperture on a PowerBook from the beginning, and have been waiting for the 1.1 release to provide better performance when working with big RAW files. That day is here. I downloaded the update and went to work. Many people will comment on the new color values readout that's available in the HUD and the Digital Loupe. Nice addition, but the three truly important changes are improved RAW decoding, faster performance on a PowerBook G4, and UB compatibility on the new MacBook Pro. After just a morning of testing, Apple appears to deliver on all three counts. When you first fire up 1.1, you're greeted with this screen (below). The library update went smoothly on one of my smaller libraries, and I'm going to test updating a bigger one later today. The workflow was smoother on the G4 that previously with the 1.0 version, and I'm looking forward to burning through a large project with this update, just so I can get to know how all the different functions perform. As for RAW decoding... well, that's going to take some side by side testing with 1.0 decodes. I do like the new RAW Fine Tuning control in the HUD. It allows me to stick with my previous 1.0 decode, or switch to the new 1.1 interpretation with added controls. My first impression is that the new rendering of my .CR2 files from a Canon 5D and Digital Rebel XT look good. Very good. Of course the real temptation is to get a MacBook Pro now that Aperture is Universal Binary. Alas, if only they had the 17" model ready. Overall, I think this is a fine upgrade, and I'm looking forward to testing all of its nooks and crannies.